Ubercart.org Shop Talk - This session is really a presentation on the Ubercart website, the community hub that is supporting the Ubercart project. I've made plenty of mistakes along the way and am hoping to show others the scars so they can learn from my (bad) example. I strongly believe that Ubercart's growing success in due to the fact that we run a distinct community site separate from Drupal.org, but that may hurt us in the long run as we forfeit greater exposure on the developer community. We still have much to learn and aren't out of ideas by any stretch of the imagination! Hello Ubercart! - This session is an introduction to Ubercart and its features. It will be aimed at the evaluator interested in seeing what Ubercart can really do. Most folks dropping in will know little more of Ubercart other than the name and a vague idea of what it does. The plan here is to walk through an install and a store setup to give people a good idea of Ubercart's core features and direction for the future. I also want to introduce attendees to Ubercart.org so they know where to go to find support, post bugs, find contributions, and check out other Ubercart sites. Ubercart Development - This session is an introduction to developing modules for Ubercart. I'll work real hard to get attendees up to speed on the development process and explain our basic goals and desires for the future. I really hope to recruit other folks during this time by getting them interested in the project. I believe it's worth anyone's investment and can name a half dozen people out there making money off my freely distributed project right now! So, there you have it. I've never been to Drupalcon, so it seems like an awful lot to take on my first go round. However, you don't fly to Spain every day, so I may as well take advantage of the time! I love public speaking, particularly about subjects I really enjoy (Bible, Christina, Drupal). This really is the perfect opportunity, and it couldn't be possible if it weren't for my uber-generous boss (Andy) sending me. I hope to make it worth his while and bring back so many code secrets he'll have to keep me under guard to make sure I'm not kidnapped by the Commies to work on their websites. I hope to use this blog to report on the conference, so feel free to check back more often next week while it's going on. Christina and I just bought a nice little digital camera with the last of our wedding money, so expect to see some pretty pictures (of things in Spain, not just of my wife). And now... it's back to work on the sessions. Well, this site has been sitting largely unused for some time now. I've scarcely touched my personal blog until just recently. Lots has been going on, including work on the Ubercart project, getting married, buying a house, and now preparing for Drupalcon. In the middle of all this, I've found enough inspiration to get this website in working order. A few good leads and opportunities to promote my consulting and development services have come my way, and it won't do to have a seldom updated, moldy site sitting around for people to find! 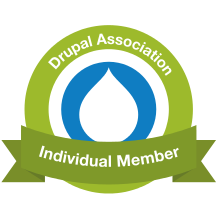 I plan on sticking with the core Drupal theme Garland as long as possible. Why? Really, I just love the way it looks! I'll do some tweaking here and there, but I imagine I'll stick with it as a vote of confidence in the Drupal core. Instead of a full custom redesign, I'll take advantage of the wonderful contributed modules I would recommend to any clients and will hopefully have something presentable in the next few days. Until then, feel free to check out any of the links above! Here in Louisville, KY things have been taking off for me. Over this weekend I found out I have a closing date on a house (528 Camp St.) on Monday at 5 PM. My fiancee just left to go back to Greenville, SC where she will prepare for our wedding which takes place in a measly 7 days! I have to head back to work for a few hours because of the Ubercart.org colossal crash. And... I need to go shopping. I don't particularly like shopping, but I need to get some last minute things for the wedding/honeymoon. I just don't really know what. I know it will be something, and that's a start.